FOUR YEARS ago, when she launched the first Sour Fest, at South Philly's Devil's Den, owner Erin Wallace was happy to offer a modest list of about a dozen sour ales, including the highly regarded likes of Petrus Aged Pale Ale, Cantillon Kriek and Russian River Consecration. At the time, the existence of these quirky, tart varieties seemed nothing more than a blip in the growth of artisan brews. Most craft brewers were focused elsewhere - on hops or high alcohol. Sour beer, by contrast, didn't seem to have much of a future - not just because of its off-putting name and unconventional flavor, but because of its somewhat complex and time-consuming brewing methods. Yet, as Wallace rounded up the draft list for her bar's fifth-annual Sour Fest, which starts Saturday, she had no problem collecting kegs of more than 50 different sour beers. Suddenly, even relative newcomers - Free Will, of Perkasie; Funk, of Emmaus; and even Wallace's 9-month-old Barren Hill Tavern & Brewery, of Lafayette Hill - are puckering up with imaginative takes on sour beer. "You can see how much the fan base for sours has grown by the amount of local brewers now making sours," Wallace said. 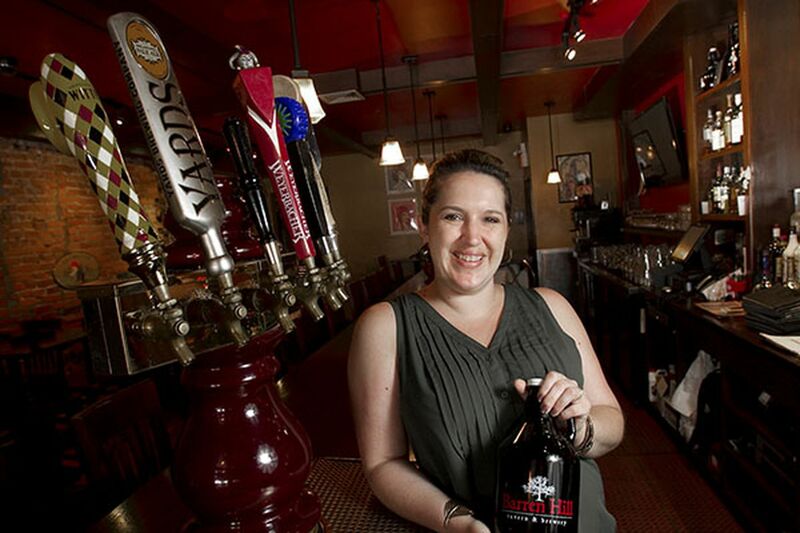 Even craft beer neophytes - folks who didn't think they liked microbrews - are falling in love with them, she said. For Wallace it was Duchesse De Bourgogne, a Flanders red ale whose sour flavor is the product of oak-cask maturation. "When I started drinking craft beer, the idea of a sour beer grossed me out," Wallace said. "I was into wheat and Belgian dark ales. Then one night I saw the bottle of Duchesse and loved the label - it reminded me of some of the paintings I studied in art history. "The beer itself reminded me of Sweet Tarts, and I loved it. That encouraged me to try some others." Experimentation is the key to appreciation because not all sour beer is the same. It can be sweet or fruity or acidic or even reminiscent of vintage (hold your nose) locker room funk. At its best, sour beer will offer layers of distinctive flavor that seemingly change with each sip. The secret is in the microbes, "the real stars of sour-beer production," author Michael Tonsmeire writes in his comprehensive new book, American Sour Beers: Innovative Techniques for Mixed Fermentations (Brewers Publications, $19.95). "In the same way that you select particular malts and hops to provide sought-after flavors," Tonsmeire says, "strains of yeast and bacteria are chosen for their distinctive contributions." It almost always begins with saccharomyces, the standard yeast genus that ferments most beers. Traditionally, brewers use a Belgian ale yeast - typically saison - which produces spicy or fruity flavors that add to the complexity of the finished beer, Tonsmeire says. Often, the beer undergoes a second round of fermentation with Brettanomyces, known as "wild" yeast because it occurs naturally and is often regarded as an infection in breweries. Brett, as aficionados call it, can give beer an apple or smoky or horse-blanket aroma. Some sour beer - notably authentic lambic from Belgium - is fermented spontaneously with ambient Brett that lives naturally in the environment. But these days, brewers more often add Brettanomyces purposefully, in controlled doses. In addition to wild yeast, sour beer can get its pucker from bacteria, typically either lactobacillus or pediococcus. Added during the mashing stage or in later conditioning stages, both produce tart-tasting lactic acid that can range from soft and thirst-quenching to sharply sour. Traditional German brewers use lacto in refreshing Berliner Weisse and Gose. While microbes do most of the work, the mastery of sour beer comes from barrel-aging. By aging beer in wood that's been exposed to wild yeast or bacteria, brewers roll the dice to create unique flavors that can be served on their own or blended. Sour Fest at Devil's Den (11th and Ellsworth streets, 215-339-0855, devilsdenphilly. com) runs Saturday through Aug. 22. On Tuesday, I'll present a primer on the many varieties of sour beer. It's open to the public, with admission ($35) including samples and appetizers. Tix are available at the bar or online at alturl.com/brzen. "Joe Sixpack" is written by Don Russell. For more on the beer scene, sign up for his weekly email update at joesixpack.net.